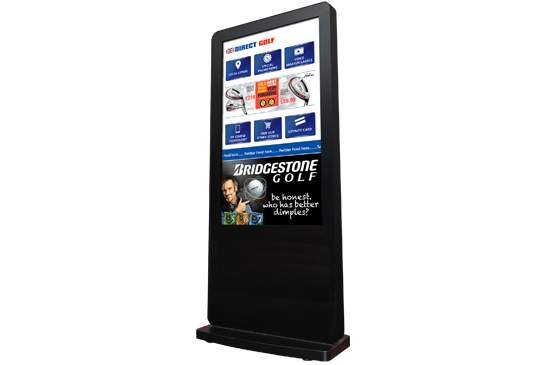 Communicating with your members & guests is important for any golf club, digital signage enables you to do this in an efficient and dynamic way elevating the clubs profile and public image whilst ensuring that the information being displayed is relevant and timely. Regardless of location from the restaurant to the pro shop, lobby to the locker room if you have a message to communicate then our digital signage solutions are the perfect fit for you! Control all your messaging centrally and ensure you are always relaying fresh and current content to your guests. Utilizing interactive displays engages the customer and enables them to make active purchasing decisions from booking team times to making restaurant reservations or keeping up to date with your latest social media posts. Keep your members and guests up to date with live golf tournaments or current news events whilst they relax before or after a round of golf. Ability to update and communicate with your members & guests in real time, update them on offers and promotions and keep them informed on upcoming events and tournaments. Increase sales within the pro shop by adding dedicated digital POS highlighting special promotions to drive revenues. Link to 3rd party advertising for service providers & generate additional revenues for your facility. Why are companies choosing TOPAZ? We can offer you a solution for ALL areas of your Golf facility… from Outside on the patio to the pro shop and everything in between! Plus with our ground breaking All Inclusive Approach you never have to worry about another cost for your digital investment. NO RECURRING FEES – what you pay on day one is your only cost. Our unique hardware approach providing everything you need built into one display, no messy cables or trying to hide components in the ceiling! Everything built into one display – Just add power! Built in Networked media player. Range of sizes 19” – 55” Freestanding. Inclusive cloud based software [with no recurring costs!]. Ability to control, update & manage all displays centrally. We would love to show you how a TOPAZ Digital solution can benefit your business, click to find your nearest reseller. Visit our microsite dedicated to digital signage in the golf industry www.digitalsignage4golf.com and see how courses like yours are benefiting from TOPAZ Digital signage!